A few weeks ago, we passed a man on the side of the road whose sign said, "Homeless but not Hopeless" and my heart was pulled out of my chest. In the quick moments between seeing the man and the light turning green, the kids and I scoured the car for something... SOMETHING for the man. I had no cash, we had no coats or gloves that weren't kid-sized, and all our snacks were half eaten. I was so frustrated that I didn't have anything for this man. I wanted to support him and remind him that his sign was spot on...he needn't feel hopeless. That day, I posted about this man on Instagram and Facebook and asked for suggestions on what I could have on hand so it didn't happen again. You may have seen it and contributed to our list! I wanted to share what we accumulated and placed inside our bags, just in case you wanted to make some, too! It had never occurred to me to make separate bags for women. I'm so glad a few people brought up that idea! In the bags specifically for women, we also placed things like tampons and brushes, as well as both hair and skincare. Facebook and Instagram friends also mentioned how many people in low-income or homeless situations have dental struggles. With that in mind, I steered clear of the beef jerky and other tougher to eat things I was originally considering. Instead, we went the route of what you see in the photo above. We also added a few other things like sausage, chips, little cutie oranges...and some candy, too. We don't travel enough to have soap, shampoo, etc from hotels. Instead, we focused on the travel size section of stores like Target and the Dollar store. Christmastime is such a great season to accumulate lots of small-sized skincare, etc because there are so many gift packages and stocking stuffers available at stores! We also found Goodwill to be a great resource. We included a flashlight or headlamp into each bag, too! In addition to making sure batteries were inside the lights, we also put extra batteries into a snack-sized ziplocks. Home Depot's stocking stuffer section had bulk packages of both the flashlights and batteries...score! Marino wool socks are fantastic so we were thrilled when we came across a bunch of them, buying about 20 pair (in both men and women's sizes) at Goodwill. They're brand new and so cozy. So much better for cold feet than simply cotton! We also got a few dozen new gloves (also men and women's sizes) at Goodwill during their 50% off sale a few weekends ago. If you're not already a member of this awesome nonprofit, sign up to be one so you can get all their emails on when things will be on deeper discount. Because I saved money, I was able to buy even more for our blessing bags! Hand and feet warmers are definitely a must...cough drops, too! I just adore that the kids wanted to write notes to put inside the bags. We didn't have enough Bibles to put in every bag, sadly. But my friend and pastor Nirup shared where we can find some online for under $2 (Spanish ones, too)! I'm going to order some for our next batch of packages to keep in the car. Another thing would be to put info on the rescue mission in your area. We love the Denver Rescue Mission and our church is working with them this advent already! What do you think? Would you do a Packing Party with your friends or family?? 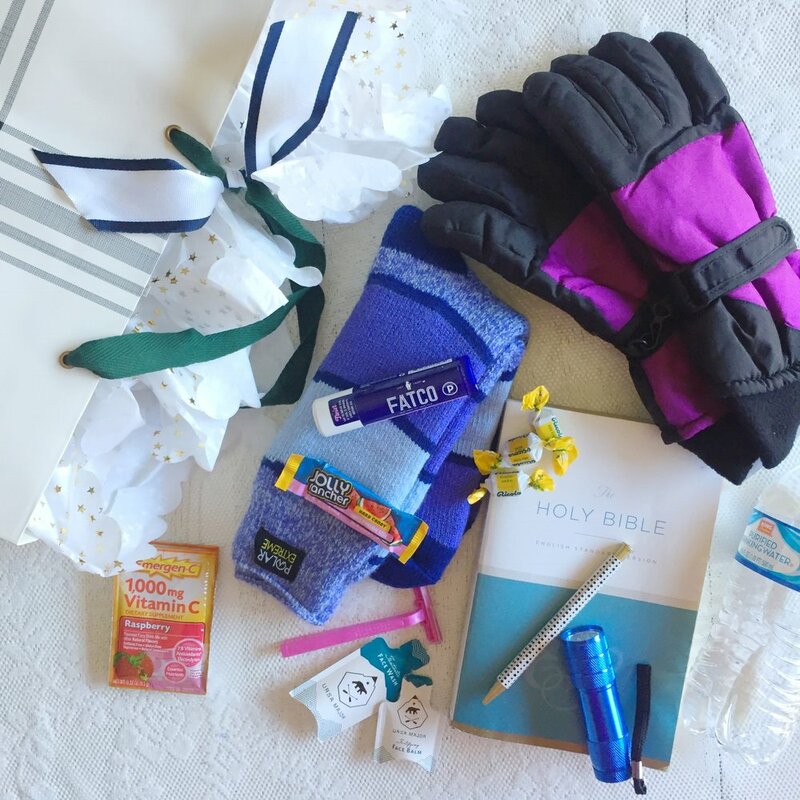 Download our shopping list so you have it with you at the store to build your own Blessing Bags! Please comment below on other things we could include or ways we could help them be reminded that they should not lose hope.